One of the loveliest aspects of nature is that everything in it has a use — the nasty, rotting zucchini as well as the lavender sprouting scented blossoms in the backyard. 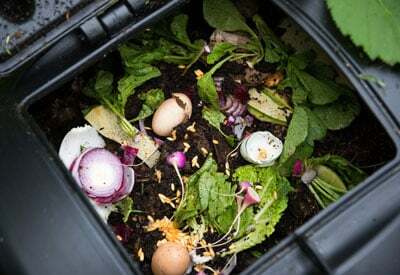 Home composting can take some of our leftovers, waste and unwanted extras and turn them into fertile soil to boost the productivity of gardens and landscapes. Here we show you how to compost at home. Compost is decomposed organic material that is produced when bacteria in soil break down garbage and biodegradable trash, resulting in a product rich in minerals that is an ideal garden or landscaping amendment. In fact, it’s nature’s perfect amendment and can be added to the soil any time of year without the fear of burning plants or polluting water. With the right equipment, turning garbage into garden gold is a cinch! 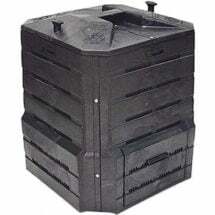 At Planet Natural we supply everything you need: bins, tumblers and activators to get your pile cooking, plus compost turners to aerate your heap. Now, let’s rot! For one, it’s free. You get to use kitchen waste, lawn clippings, leaves and other vegetation that would otherwise get thrown away. In fact, you might even save money on landfill fees. Potting mixes and soils that are rich in compost produce vigorous plants regardless of whether you’re growing vegetables, growing herbs or organic rose gardening. Improves garden soil structure, texture and aeration. Adding compost improves soil fertility and stimulates healthy root development in plants. The organic matter provided in compost provides food for microorganisms, which keeps the soil in a healthy, balanced condition. No need to add fertilizer — just mix compost into the soil. Compost contains nutrients that plants need for optimum growth, such as nitrogen, phosphorus, and potassium. And it’s an especially good supplier of micronutrients that are needed in small quantities such as boron, cobalt, copper, iodine, iron, manganese, molybdenum and zinc. It feels good. When else can you turn trash into treasure? Plus, scraps stay out of the landfill, reducing your footprint. You mix yard and kitchen waste in a pile or bin and provide the right conditions to encourage decomposition. Let bacteria and fungi go to work recycling waste material into fertilizer. Mix compost into garden soil or use it on the surface as mulch. Sounds simple, right? Well it is. Microbes are hard at work chomping down your throwaways. You supply the organic materials, water, and oxygen. The bacteria that are already there decompose the plant material into compost. As the bacteria break down the materials they release heat, which is concentrated in the center of the pile. Everyone has a different level of commitment when it comes to composting. For some a rot pile in the backyard is good enough. Others want to apply the rigors of science and constant vigilance to ensure the best (and quickest) compost around. Most of us are somewhere in between. Regardless of your level of experience, Planet Natural offers a wide selection of composting bins, tumblers and supplies to get you started. 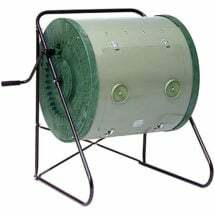 Easy to assemble and maintain, the SoilSaver Composter is a good-looking addition to any backyard. Its award-winning design is constructed of black plastic (50% recycled) to absorb and retain heat, enhancing the composting process. Simple and efficient, yet affordable… what’s not to like? Use the steps below as a guideline for how to compost. The more you follow them, the better your finished product will be. 1.) Select a site for your pile or bin. To keep your neighbors happy, consider a discreet location. You’ll also want to locate a spot with good airflow, access to water and partial shade in the summer (to keep the pile from getting too hot), but good sun in the winter (to keep the pile warm). 2.) Choose a bin. You can purchase a composter, or make your own. Rotating bins make turning your treasure easy and keeps animals out, but it is easy to make a workable bin on your own (see How to Build a Compost Bin). One simple method is to track down shipping pallets. Use one for the bottom. Pound in metal support poles and add pallets by slipping them over the support poles to make your bin’s walls. Make your pile about 3x3x3 feet. This size is big enough to create its own heat, but small enough to turn. 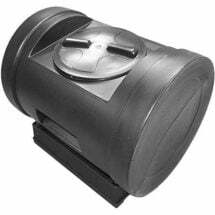 If you are using a commercial composter you won’t need to worry about the size. 3.) Add materials. Not everything can go into the compost bin; read on to find out what can and cannot be composted. 4.) Monitor temperature, aeration, moisture and the carbon to nitrogen ratio for optimum levels. The easiest way to test your compost’s temperature is to stick your hand in the center of the pile. If it is hot or warm — good job. If it is the same temperature as the ambient air, the microbes have slowed down — and so has the composting process. 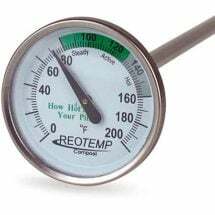 You can also use a compost thermometer to take your pile’s temperature. A properly working compost pile will heat up to temperatures of 140-160°F. At these temperatures most pathogens and weed seeds are destroyed. When your pile is really “cooking,” it can reach temperatures of up to 170°F. If the temperature of your pile peaks and then starts to drop, it’s time to turn the pile. The microbes hard at work in your compost pile require just the right amount of water. Too much means organic waste won’t decompose, too little and you’ll kill the bacteria. Compost should feel moist, but not soaking wet — like a wrung out sponge. Composting works best with 40-60% moisture content. More on monitoring compost moisture here. For perfect compost, maintain a C:N ratio of 25 to 30 parts carbon to 1 part nitrogen, or 25-30:1. If the C:N ratio is too high (not enough nitrogen) decomposition will slow down. If the C:N ratio is too low (not enough carbon) you’ll end up with a smelly pile. Read our article Carbon-to-Nitrogen Ratios to learn more about reaching this perfect balance between brown and green materials. In general things that are brown (dried leaves, newspaper, straw) are higher in carbon than things that are green (vegetable scraps, garden waste, grass clippings). Everyone needs to breathe, even tiny microorganisms, so make sure enough oxygen is getting into your pile by turning your compost often. 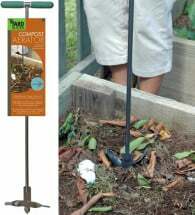 Use a compost aerator or pitchfork to mix your pile. 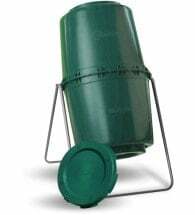 If you are using a compost tumbler, you’ve got it easy. Just crank that lever. If you are using easily compacted materials (such as ashes or sawdust) mix in coarser materials first. People who build large piles often add tree branches or even ventilation tubes vertically into different parts of the pile to be shaken occasionally, to maximize air circulation. Efficient decomposition can only occur if sufficient oxygen is present. The Yard Butler® Compost Turner is an effective way to add oxygen and bring microbes into contact with newly added material. Piles that are not aerated may produce an unpleasant odor that’s symptomatic of anaerobic decomposition. Mixing with an aeration tool‎ keeps it fresh! 5.) Mix rich, earthy compost into garden soil, or pile on top of the soil as mulch. 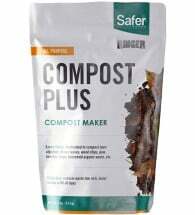 Help start a new compost pile with blood meal, cottonseed meal, well-aged manure or compost starter. They are rich in nitrogen and help “fire-up” the microbes responsible for breaking down organic matter into compost. Chop or shred materials before putting them in the compost pile or bin. The smaller it is, the faster it will break down. 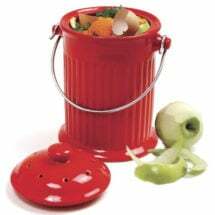 Use a kitchen compost pail or crock for storing food scraps. It will reduce the number of trips you make to the compost pile. Add a lot to your pile at once, rather than in small doses to encourage the pile to heat up. Turn, turn, turn. Turning compost will introduce oxygen and speed up the composting process. Keep you pile or bin in the sun. Microbes are more active when warm. Activators can get a slow compost heap sped up. Got compost? When finished it should look, feel and smell like rich, dark soil. You should not be able to recognize any of the items you put in there. Finished compost is usually less than half the volume of the materials you started with, but it’s much denser. Apply finished compost to your garden about 2-4 weeks before you plant, giving the compost time to integrate and stabilize within the soil. Does your compost stink? Is it dry and brittle? Is nothing happening? Are maggots freaking you out? Check out this troubleshooting guide to find out what’s wrong. Holds several days worth of vegetable peels and food scraps. Dishwasher safe. Neatly stores veggie peels and other table scraps destined for the outdoor pile or heap. Fantastic article. I’ve read many on composting (this is my first year giving it a go), but none so thorough. Thank you! I started composting last year and will be using my compost this year. I was putting my compost on the ground until I noticed the moles were taking all of it off and messing up my back yard. I put out moth balls to stop the moles but they would just tunnel around the balls. So I have started putting my compost in a half 55 gallon barrel that was full of last years left over potting soil (what I planted my tomatoes in). I am mixing the old potting soil with the compost. I have to plant my garden in pots due to I do not have anything to break the land up. My question is can I use my compost in my pots/buckets to grow flowers and veggis this upcoming year? I go once a week and take a shovel and move the stuff around in the barrel, but I can’t see any progress in decomposing. I have been composting more than 45 years ( I am 39 ) and have tried many ‘techniques’ and containers. I try to keep things as low cost as I can. From what you have described, not seeing and feeling it in person, I am assuming the 55 gal drum does not have drainage. But, even if it does, a non-working compost pile is probably too wet or too dry. If the 55 gal drum is covered and not watered ( by the person ) it will be dry. If it gets rained in, with no drainage it will just fill up with water. Even with drainage, the organic material will become saturated and slow the rain just running through it, and it will become too soggy to decompose properly. If by chance, the moisture is just right, then it must need a ‘compost starter’. That means the micro-organisms that break down the organic matter is not there, or not in sufficient quantity. Garden soil can provide a starter, or ‘good manure’, or a commercially bought starter could be used. If you have a neighbor with a compost pile, ask for a quart or gallon of some of his compost that is in the center of the pile, about a month old. 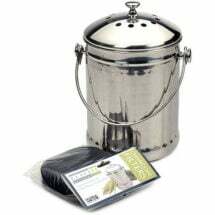 Can you compost rice hulls? Composting is certainly a labor of love and is well worth the effort, if done correctly. Our plants will thank us for it. Great read! Thank you so much for this. I do it by layering. First sprinkle one bucket of loose soil in a barrel. Then pile up all peels, grass clippings, kitchen leftovers for 10 days then sprinkle a little loose soil & 2 mugs of water … turn upside down. Repeat for 3 months/ until the barrel fills up — always cover it. After 3 months you will see the waste materials have been turned to BLACK-GOLD! I use manure while preparing the soil… the vegetables tastes GREAT ! How does one compost for 45 years if your only 39?